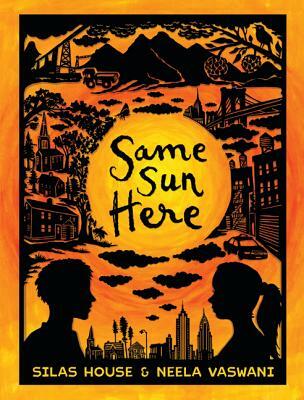 Same Sun Here by Silas House and Neela Vaswani. Grades 5-8. Candlewick, February 2012. 297 pages. Reviewed from ARC received at ALA Midwinter. When New Yorker Meena and Kentucky boy River sign up for a pen pal program, they have no idea that they're each finding a kindred spirit. Who would have thought that two 12-year-olds from such different backgrounds could have so much in common? Meena was born in India and moved to New York City to be with her family when she was nine. River has lived in a tiny town in Eastern Kentucky his entire life. As the two write letters back and forth, they discover that they share a love of mountains, they both have a special relationship with their grandmothers, and there are political issues in their hometowns that could have disastrous effects on both of them. Neela Vaswani and Silas House create two characters that have strong, identifiable voices. I loved getting to know these kids as they wrote back and forth to each other. As Meena and River write letters, they promise to be their own true selves with each other. This leads to the sort of frank discussion about cultural differences and gender differences that might never happen with a face-to-face friendship. The reader can see both Meena and River growing as they learn from each other and as they teach each other. And since they're each being open and honest, they quickly form a strong bond. Even though they're very different, both Meena and River face discrimination because of the way they look and talk. I found it really interesting that the book explores political issues affecting each of the protagonists, and the issues are dealt with in a very kid-friendly way. We see River dealing with mountaintop removal (a form of coal mining that completely decimates mountains and the communities that sit on top of them). His grandmother is an activist and River gets involved in some of the protests. Meena is dealing with the threat of eviction because her family illegally sublets a rent-controlled apartment. The landlord lets the apartments fall into disrepair in hopes of getting rid of those with rent-control, so he can get new tenants and charge them more. Although Meena is frank about her family living in a not-quite-legal situation, we also see that although her family works very hard, it's still a struggle for them to survive in New York. This is a story with a lot of heart and two characters that kids will identify with and learn from. As far as audience, I think it straddles the gap between Andrew Clements's Extra Credit (about an American girl sharing letters with a boy from Afghanistan) and Valerie Zenatti's A Bottle in the Gaza Sea (about an Israeli girl sharing letters with a Palestinian boy). 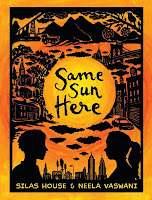 Same Sun Here will be on shelves February 14!